Thanks for your interest. Let me first briefly outline the main parameters followed by an outline on the two major climatic changes since 1850. As effective as the wind by ploughing through the sea. • At about 1850 the Little Ice Age ended and screw driven vessels entered the scene. • This results in a large exchange of warmer to colder water and vice versa. • Any downward exchange happens immediately, and becomes part of the internal structure (heat and salinity). Any interaction between sea surface and the atmosphere happens only under certain (complex) conditions. • The net impact is that the oceans presumably take in more heat as it is released again quickly. • 160 years shipping and other ocean uses may have significantly contributed to global warming since 1850 (for example over the nighttime and winter seasons). • As very little (at best) is known about these processes, the two major climatic changes provide helpful clues. Main aspects of the two climatic changes, 1918/19-1939 & 1939/40 to mid-1970s. 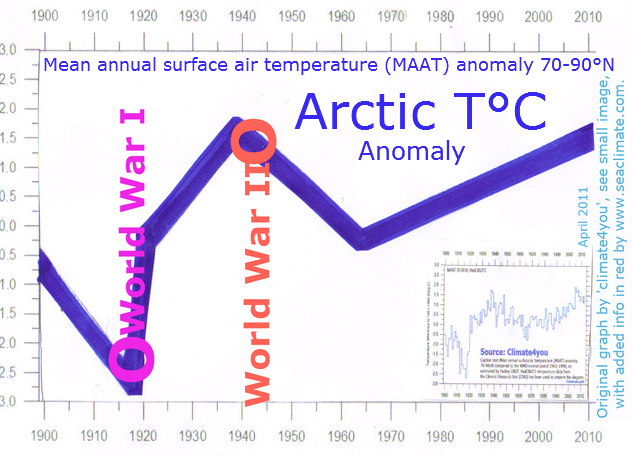 Winter temperatures exploded at Svalbard, and subsequently in the Atlantic sector of the Arctic Ocean, warming the Northern Hemisphere until WWII (USA until about 1933, Europe until 1939).The cause was likely a significant shift in the water structure (before and behind the Fram Strait), due to enormous naval activities around Great Britain that changed the heat and salinity structure of water masses from west of GB to the North Sea that all flows north. Naval war is the likely main contributor of this warming. I discuss this event over about 175 pages (from a total of 220 pages), as each winter has specific features, as well with regard to naval activities. Europe’s sea areas (including the North and Baltic Sea) have stored a maximum heat by the end of August, which is usually released until end of March. Stirring hot coffee will cool it down; so will 1000 naval ships and other war activities at sea. Cold air from Siberia can take reign. That is anthropogenic climate change purely based on a large scale experiment with climate. It is evident naval actions caused these three extreme winters. B. 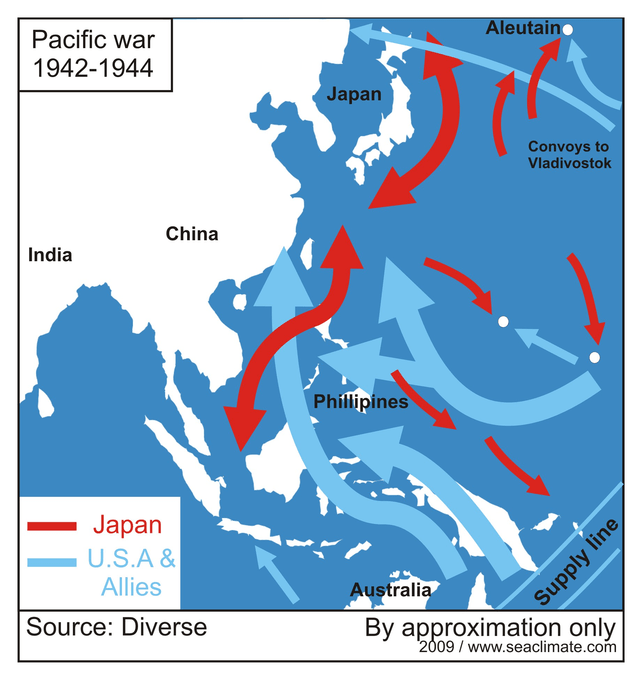 The North Atlantic and the West-Pacific became a major naval battle ground after Pearl Harbor in December 1941. Operations penetrated the sea surface layer down to depths of 200 meters, not to mention ships, and airplanes sunk, and the many million shells fired. Global cooling was established for three decades, because several years’ war at sea generated a huge chaos in a very complex water structure (heat & salinity), which needed more than three decades to ‘recover’. The three extreme winters in Europe “tell it all”. Climate sciences had seven decades time to analyze the ‘large scale field experiment”. A thorough understanding would definitely establish that naval war activities was the major cause, which subsequently would inevitable require to investigate the Arctic warming and global cooling as a naval war related matter (to a very noticeable degree) as well. Actually, understanding “Climate as the continuation of the oceans by other means” would have raised an alert more than one century ago that screw driven vessels and other human activities at sea may change the sea in a way that alters weather and climate. No, Thank you, Dr. Bernaerts.